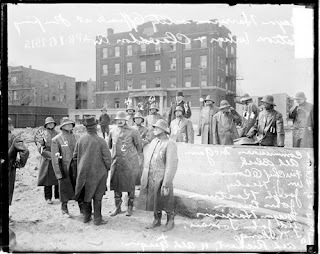 Portrait of Joseph Kostner, Mayor Carter H. Harrison, Jr. and city officials, wearing rain coats and hats, standing on the street at the Mayfair Water Pumping Station at West Wilson and North Clarendon Avenues in the Uptown community area of Chicago, Illinois. Officials include Commissioner McGowan. DN-0064322, Chicago Daily News negatives collection, Chicago Historical Society. labeled Cuneo Hospital. Obviously not the Cuneo at Clarendon & Montrose. Where exactly was this then and what happened to it? I believe that building is at the corner of Agatite and Clarendon and there was an alley to the left of the building. When the Cuneo was built in the late fifties there was an overhead enclosed crosswalk that crossed Clarendon at that alley and tied into both of those older buildings. They tore down those buildings to make way for the structure that is now boarded up.